I suffer from a long-standing love affair with vintage saxes. Sadly, these saxophones come in vintage cases, many of which are starting to turn to sawdust (like the one pictured on the left). The leather strap that holds the bell up disintegrated the day before a long road trip. I managed to attach an old belt but it just barely survived the trip before the wood the belt was attached to gave out. It became clear that simple repairs were no longer an option—I needed a new case if I was going to take this horn out of the house. This would become the wheels. The towel was covering exposed plywood. For the smaller, common horns (soprano, alto, tenor, & bari), this is not really a problem, since there are many fine after-market cases available. 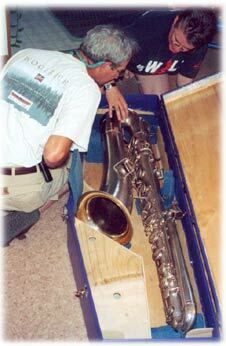 But when the customer is a bass sax owner, it becomes a bit trickier, since there are very few companies that make bass cases to fit an 80-year-old horn. The story that follows, tells how I came to own my custom- built case. 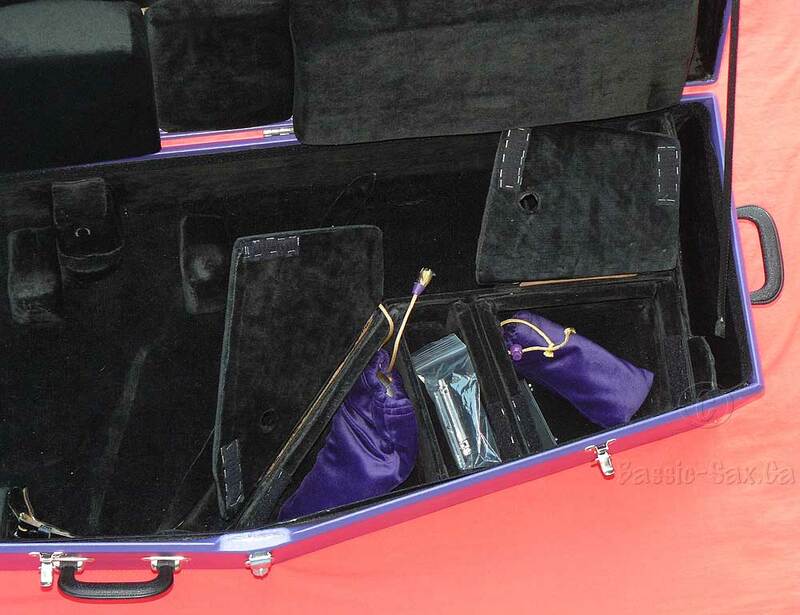 When I decided to replace the case for my bass saxophone, I first did some checking into the availability of new cases. I found out that my choices were very limited. 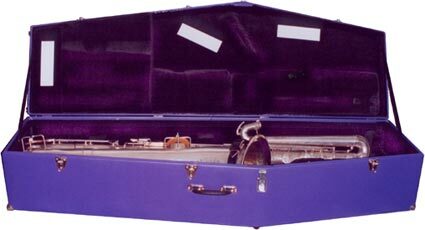 Basically, I could get a generic bass sax case, made by Allied, for about $450 US. 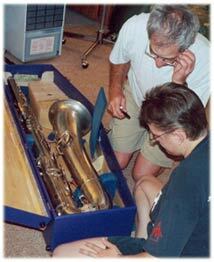 I really wanted something that was a bit more specific to the horn, so I contacted Walt Johnson. A case for my Buescher would be $850 US. On the Sax On The Web discussion forum, a number of bass sax players had started to exchange ideas. 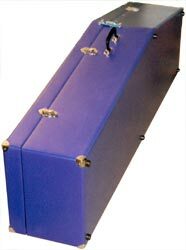 Steve Weinert, from Wisconsin, was in the process of convincing General Woodworking (which makes OEM instrument cases) to design and build bass sax replacement cases. I started figuring what it would cost, given the exchange rate, taxes, and shipping, and I began to think that there had to be a better way to go about this. A friend suggested that I get a boat builder to build a custom case for me. There is a community college in nearby Saint Andrews that offers a boat-building program. She suggested that I find a graduate from that program to help me. Through another friend, I found a skilled craftsman, Bruce Campbell. Bruce is based in Saint Andrews, New Brunswick. Besides being a boat builder, Bruce also plays French horn, so he is familiar with the delicacy of musical instruments. I gave Bruce a call in January 2002. He came to visit me a few weeks later. After spending some time talking to me and looking at the existing case (that was disintegrating), we decided to proceed in the design of a new case, rather than trying to rebuild the old one. Working on the storage compartments. Working on the foam supports. Bruce took some preliminary measurements, and said that he was busy until at least the middle of February, but would start to think about it and begin to come up with a plan. The next time he came to visit, we began to think about things: What shape should this case be? How would I want it finished? What kind of hinges and case closures did I want? Did I want wheels? What kind of storage did I want inside the case? Etc. Etc. For an indecisive person like myself, this was truly torturous. I agonized over ever detail, trying to make the best choices possible. We decided on a 5-sided box, rather than a rectangle. With this in mind, Bruce went about making the final measurements. 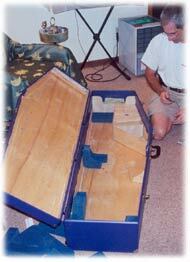 The next time I saw Bruce, he came to visit with a fiberglassed wooden box, that resembled a coffin in size and shape. We tried to lay the sax in the box. Success! His measurements had been extremely accurate. The sax fit in perfectly, with enough room for padding on all sides. 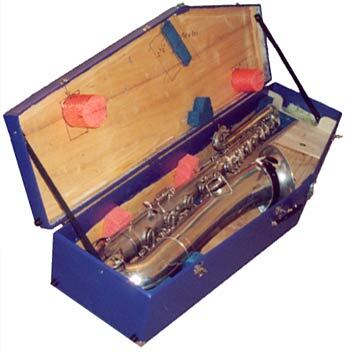 We decided to use rigid foam to build the sax support structures inside the case. The foam water-noodles that children use in a pool are what we decided upon. This material is firm enough to support the weight of the horn, but soft enough to not cause any damage. 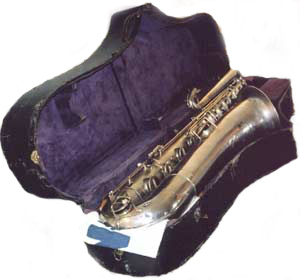 It also has a memory, so the weight and angles of the sax would ensure a custom fit. Shaving the foam with an Exacto knife. Because I wanted wheels on the case, Bruce had done extensive investigation about wheel options. I wanted to protect the horn as much as possible from jarring and bumping while it was being pulled, so Bruce checked with skate board and in-line skate stores to see about the kind of wheels with mini shock absorbers built in. The problem was that had he recessed the wheels like a piece of pull luggage, the case integrity would have been compromised. Or, he would have had to make the case even longer. Attaching the wheels on the outside like the Walt Johnson company does did not allow for stacking very well. So after all that, we decided to instead use a dolly he had found. 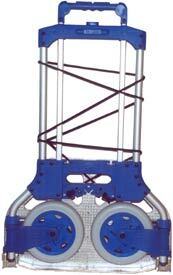 This dolly has extremely big, soft wheels, so jarring would be kept to a minimum. It would be useful for my other gear as well. The bonus is that it folds extremely flat, so it takes up very little room when not in use, and it also happens to fold out extremely easily. While he was here that time, he also brought a catalogue that had many types of hardware. I picked out the handles, the corner pieces, the latches, and the hinging. We then talked about case finish. I decided to go with a marine-grade vinyl. The other option that we discussed was a high-gloss boat finish, but I thought that the vinyl would hold up to scuffs better. Bruce found an upholstery shop in Fredericton that carried marine vinyl. Because purple is my favourite colour, that’s the colour I wanted the case to be. Besides being unusual, I thought it would be somewhat of a theft deterrent. 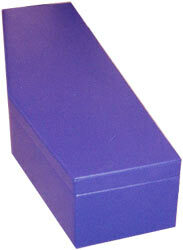 You can’t walk away with a purple box the size of a child’s coffin without someone noticing! A perfect fit! Or so we thought. I went to Ron’s Upholstery and picked out my exterior fabric. For interior material, I decided on a black velvet upholstery fabric. I ordered both of these from Ron. The next time I saw Bruce, he came with a big purple box. Rather than do the work himself, he had the upholsterer cover the outside of the case with the vinyl. They did an amazing job. On this visit, Bruce and I finalized the plans for the inside storage. In July, Bruce came for what would be the last time. With all the interior storage pieces installed, all that was left was to attach the remainder of the hardware, attach a belt to support the bell on the inside, custom cut and place all the hard foam supporting pieces for the horn, and measure what thickness of foam was needed to line the roof of the case to prevent the horn from moving around. That took us a full day. Then all I had to do was drop the case off at Ron’s Upholstery Shop so that they could do the interior upholstery. When I took the case to Ron’s shop, it became clear that we had made a couple of mistakes that made it more difficult for the upholsterers. Bruce and I had carefully cut and shaped the foam support pieces for the horn and attached them inside the case with double-sided tape and glue to keep them from shifting position. That was our first mistake. Ron didn’t know how he could cover all these different shapes, sizes, and heights and have it look good—without removing them. If he removed them we would have to spend another day figuring out how to put them back in the right place. The other big problem was that he didn’t know how to cover the wooden accessory boxes with fabric now that they were all nailed and glued into place. Ron asked me to leave the case with him. If I didn’t need it in the next week or two, he could spend some time really thinking things over, and coming up with the best way to line the case. He didn’t want to have his name connected to something that didn’t look good, but he also wanted this to be affordable for me. About 6 weeks later, I received a call from Ron. The case was ready. When I got to the upholstery shop, I was amazed at how good a job Bill did. It was beautiful. Ron gave me a price break—to keep the cost “affordable”, as it had taken Bill about 20 hours to do the work. When I got home, I tried to put the sax in the case. Unfortunately it no longer fit. The fit was too tight. There was too much pressure placed on the delicate keys. I called Ron’s shop, and we made an appointment for the next week. When I went back to Ron’s for the last time, with the new case and the horn, Bill was able to remove the fabric to get at the pieces that were causing the problems. He cut them where necessary to insure everything fit well. He then glued the fabric back in place and we did the final fitting. Finally, after 80 years, the bass had a new case! In hindsight, if I were to do the whole case adventure all over again, certain things would be different. If you want to try this yourself, you really need to understand how the box is going to be upholstered. Almost everything that caused problems (and extra expense) with this project was a direct result of us having no experience with upholstery work. 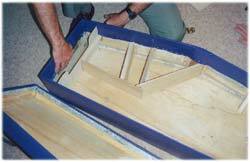 Bruce had added a thin strip of metal around the opening of the box give it strength as well as create a perfect seal. This made the upholstery job more difficult. The vinyl outer covering had to be brought over the metal and down into the interior of the box a few inches to be stapled down on the wood. The interior fabric then had to be glued around the top rather than stapled. Gluing the foam supports and the walls of the interior compartments into the box. The box really should have been upholstered first and then each piece upholstered before anything was glued down in place. Not understanding the way things were going to be upholstered, we did not take into account that in some places there were as many as 4 layers of fabric. We failed to take into account that 4 layers of fabric would throw off our careful measurements and cause the horn not to fit.